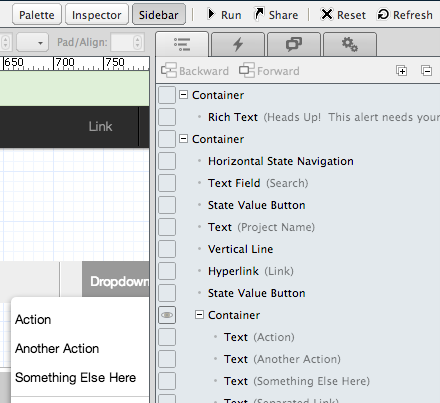 The Component Outline Tab in the Sidebar displays the names of all components used in a design. Use the Component Outline to select and configure components, to modify the component stacking order, and to easily toggle component visibility if a state is used. To open the outline, click the Sidebar button in the Editor toolbar, or use the keyboard shortcut. If the design has a template assigned, the components associated with the template are not displayed in the outline. You must edit the template to access these components. The Component Outlne tab is shown below. The order of the components is given by the order they are added to the Editor. This order defines the component stacking order as described in Bring Forward and Send Backward. Components may be re-ordered or moved between containers by dragging and dropping them with the mouse. You can also shift-click to select a range of components to move.